And yes, I finally found Syndicate again, which is the funniest and coolest games in the genre of controlling people to kill something. Im Hauskreis bei uns in der http://kaiserslautern.feg.de machen wir am 29.11.2004 das Thema Evolution durch. Also den Christlichen Schöpfungsmythos und den Bezug zur Wissenschaft. Grundaussage von “The Origin of Species”. Mutation, Selektion. Bibel Interpretation wörtlich nach dem Wortlaut? Ja, jedes Wort ist genauso wie gott diktiert hat und ist wörtlich zu interpretieren. Nein, die Überlieferung ist fehlerhaft, der Text muss auf Entstehung und theologische Aussagen ausgelegt werden. Bibel Interpretation im historischen Kontext-auf welche anderen Schöpfungsmythen (und Grosse-Flut Mythen) bezieht sich Genesis und will ich das wahrhaben? Evolution als Religion? Ja, man kann aus der Evolutionstherie ethische Werte ableiten. Nein, ethische Werte werden durch Gott und Gesellschaft gegeben. Theistische Evolution – schuf Gott durch Evolution? Ja, Gott steckt hinter all dem. Nein, wer diese dinge verbinden will ist ein Sünder. The deluge, according to the Chaldean epic, was due to the judgment of the gods Anu, Bel, and Ninip, and Ea told the “man of Surripak”, Samas-Napiati (the living sun), to build a ship to preserve plants and living beings; it was to be 600 cubits long, and 60 broad and high. Numerous details of the building and construction are given; and Xisuthrus with his people, and animals, and plants, and food had entered the ship, “the waters of dawn arose at daybreak, a black cloud from the horizon of heaven. Rimmon in the midst of it thundered, and Nebo and the wind-god went in front.” The earth was covered, and all living things destroyed. Even the gods were afraid at the whirlwind,and took refuge in the heaven of Anu. After six days and nights the storm abated, and the rain ceased, and the wind and deluge ended. “I watched the sea making a noise, and the whole of mankind were turned to clay, like reeds the corpses floated…In the country of Nizir (east of Assyria) rested the ship; the mountain of Nizir stopped the ship,and to pass over it it was not able…On the seventh day I sent forth a dove, and it left. The dove went, it returned, and a resting-place it did not find, and it came back.” Later a raven was sent forth, and it did not return. Then the ship was opened, the animals came forth, sacrifice was offered to the gods, and Xisuthrus became the father of Izdubar, himself being later translated to live as a god. We cannot attempt a detailed comparison of the Chaldean and Noachian floods, for which reference must be made to Professor Sayce’s edition of Mr. Smith’s “Chaldean Account of Genesis”; but we may remark that this deluge narrative, perhaps more than anything else, shows how closely the narratives in Genesis are related to Chaldean traditions or sources of information. as part of the project Silver Fire we had our first Silver fire to the roböxotica in vienna. use babelfish to get this to english, if you need. german! .. wir hätten dich sonst mehr vermisst. In Österreich singen wir bei Geburtstagsfeiern immer “Happy Birthday to you,. Happy birthday to you, Happy Birthday dear X, Happy Birthday to you”. An sich ein recht simples und nichtiges lied. Viel schöner ist eins, dass wir neuerdings im Ikea gehört haben. Ikea deutschland hatte “Geburtstag”, der Konzern hat vor Y Jahren seine erste Filiale in Deutschland eröffnet. Interessant daran, dass eine Firma wie eine Person behandelt wird (semantic!). Und ein Angebot: wenn du an diesem Tag durchs Kaufhaus-Micro ein Geburtstagslied singst, bekommst du einen Sekt und Schnickschnack. Ingrid war sofort dabei. Ich hatte bedenken, einem globalem Multi einen schönen Geburtstag zu wünschen, aber ich alte Werbeschlampe mache für Sekt ja auch alles. Nun der eigentliche PUNKT : . Ein anderer Kunde von IKEA sang einen ganz tollen Geburtstagssong, den will ich in Zukunft immer singen wenns Geburtstage gibt. The Silver Fire project (created by me) is to use ideas from a science fiction novel to create a global party. The first step to this vision is to use videoconferencing software to attend parties as a virtual person. The virtual guest sits somewhere home or in a remote clubbing area (like www.kaiserslautern.de) and wants to attend a party at another physical location now called SilverFireParty. On the SilverFireParty, another person has a laptop running with WLAN, a Webcam, Microfone and a Video-conference software. The person at the silverFireParty is called PhysicalGuest. The physical guest plays host to the virtual guest. The physical guest carries his/her laptop to locations of the party, hence the virtual guest is moved there. the virtual guest can attend the SilverFireParty throgh this laptop, the laptop is an Avatar in real world for the virtual guest. The avatar laptop belongs to the physical guest, but is “owned” by the virtual guest as a mean to attend the party. So the virtual guest sits, bound to his/her avatar laptop, at the party and can drink beer, smoke cigarrettes and talk to people on the party. A global party is possible! the outcome of the first try for this project was quite a fail. The chosen webcam by creative did not work on MAc OSX. The WLAN connection at the party was crap and we had netsplits. The major problem was that the physical guest did not setup the videoconferencing software properly and we needed 90 minutes of ICQ’ing and messing around with drivers when we should be partying. Hence the physical guest should be experienced in Video Conferencing and be also willing to “play host” to the virtual guest. If the physical guest is not dedicated to this, the virtual guest is helpless and alone. most important: both need to be dedicated to the SilverFire! but I was attending as a virtual guest, so it was quite cool. how about coding the rules of christian theology as RDF inference engine? In the fabolous effort to build something called semantic web (or often known as “the topic with the uri http://www.w3.org/2001/sw”), we have gone a step ahead. Benja Fallenstein from the fenfire project is a visiting scientist at the DFKI at the moment. He came on tuesday and will go back home tomorrow. The goal of his visit is to discuss ontologies, discuss mutual working together and bringing gnowsis and fenfire closer to each other. Fenfire is a research project developing an RDF-based desktop environment, including a great RDF browsing and editing tool. see screenshots. At the moment fenfire uses RDF files (f.e. in Turtle) to get the triples. 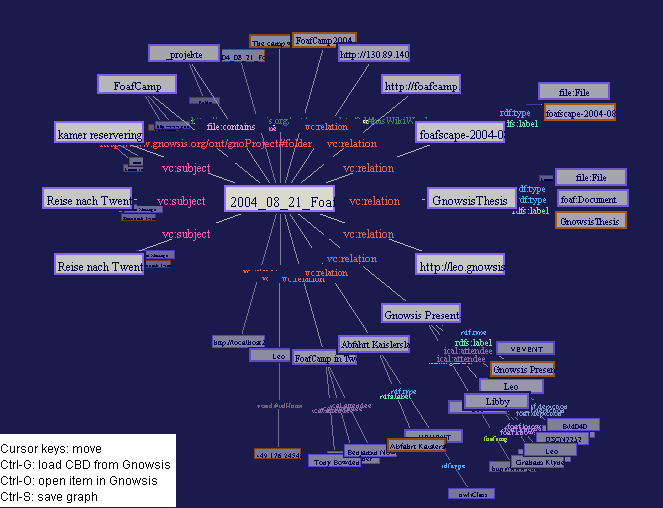 Wouldn’t it be great if fenfire would display gnowsis RDF from the Semantic Desktop instead? And if we could press a button and – from the fenfire graph browser – open the displayed resources in their corresponding hosting applications? 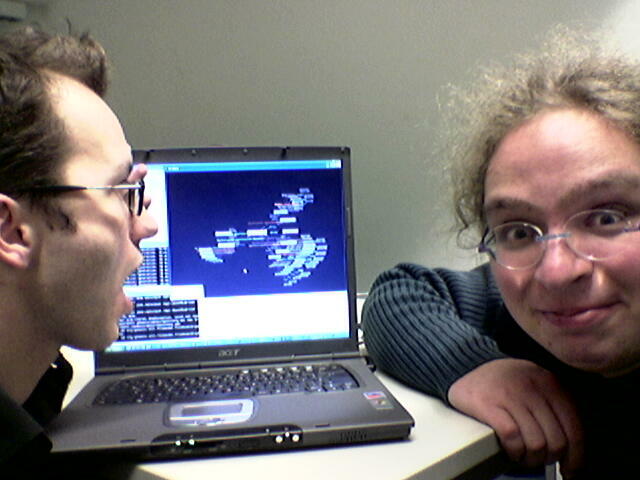 Benja and me sat together today (18 Nov 2004) and joined our Notebooks in a little Lan. Benja hacked the fenfire part, I added a little forwarding mechanism to gnowsis, bugs in both projects were found and fixed. 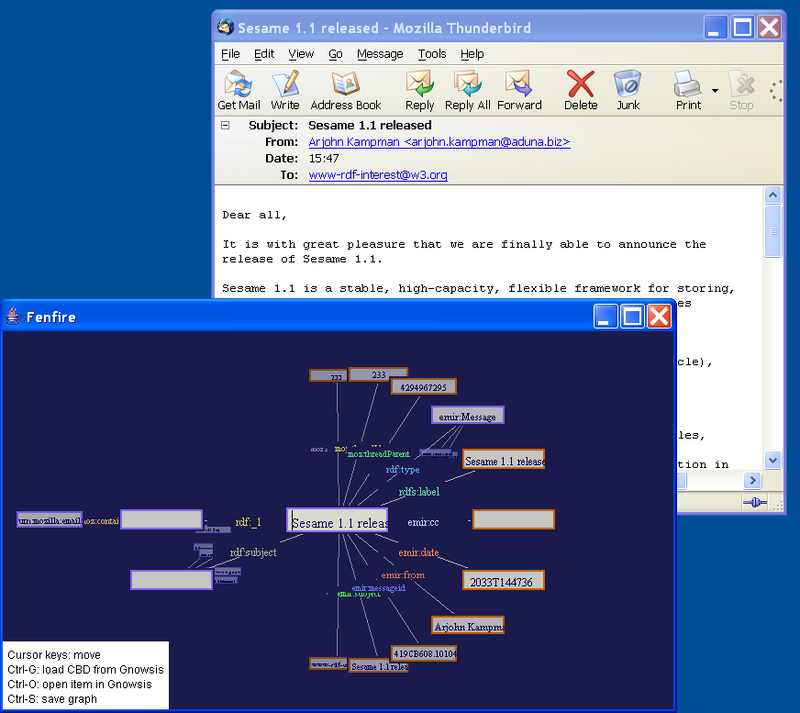 16:00 – fenfire browses emails as graph! 18:00 – bugfixing, brainstorming, ideas…. Gnowsis and Fenfire have met and another time, great Semantic Web developers (aka us) have proven that using ontologies, RDF and web protocols RULEZ. In just a day, two open source projects made substantial integration work. a great article about the outcome when you enter the fabolous “crash youre system, yeir newbie” commands. It is written in a good way and easy to understand. The article is also a good example of doing a scientific experiment and documenting it. In Deutschland verwendet man das Wort “Stiege” kaum. Das an sich ist interessant, hat aber auch ein paar praktische Auswirkungen. Dies wurde an mehreren Kollegen und Hilfswissenschaftern meiner Firma getestet. Auch ein Gast, der gerade hier ist verwendet das Wort Stiege nicht. Die Stiege als Architektonischer Raum hat kein “Stiegenhaus”. Der Weg ist nicht das Ziel. Ja aber wohin geht “der Deutsche” dann? Nach langer Gemeindsuche hat sich jetzt eine Gemeinde herauskristallisiert, zu der wir öfter gehen wollen. Godi ist sonntag 11:00, was eine definitiv christliche zeit ist. Es gibt Hauskreise und alles was das Herz begehrt, gott ist gut.